Ready to get back on the trails? Enjoy UW-Green Bay’s beautiful arboretum trails while participating in this fun wellness challenge for employees! This five-week challenge will last from Monday, April 9th to Friday, May 11th, and each week, there will be a poster like the image above on a trail kiosk. Simply take a photo of the poster (or a selfie with the poster!) 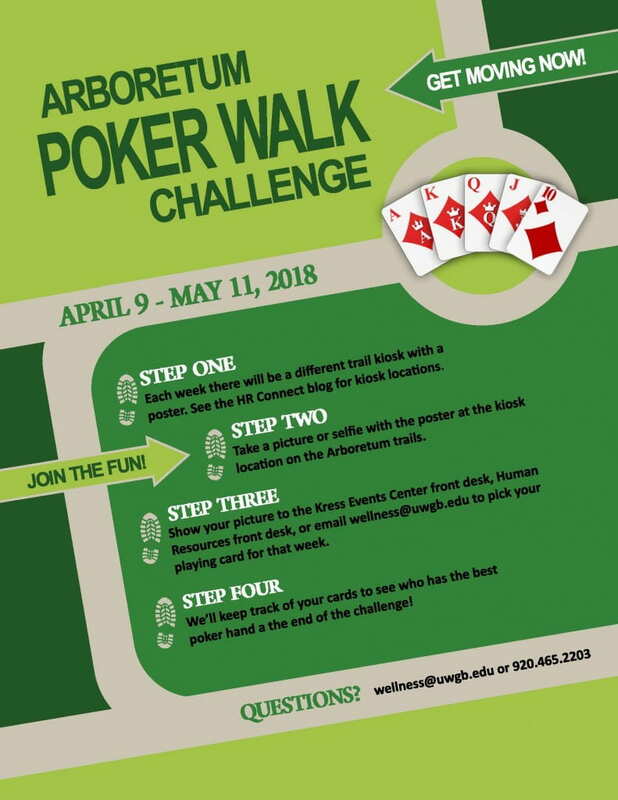 with your phone when you are out on the trail, and then show your pic to the Kress Events Center front desk, the Human Resources front desk (CL 710), or email it to wellness@uwgb.edu to pick your playing card for that week. We’ll keep track of the cards you pick, and then at the end of the five weeks, we’ll see who has the best poker hand! Don’t have a camera on your phone but want to participate? Please email wellness@uwgb.edu. Where will the poster be each week? Click on this link to see which trail to take to get to that week’s poster. Questions? Please email us at wellness@uwgb.edu or call ext. 2203.